When our hosts asked us to ride the press test bikes to the technical presentation, I thought it was a bit strange; motorcycle journos are usually corralled onto buses and shuttled to the press conference if it is offsite from the hosting hotel. Then I thought maybe Ducati had blown its budget for the 2015 Diavel press launch on the location itself, with no money left for a rental bus. We were, after all, in Monaco, where you can quench your thirst with a Coke for a paltry seven euro. Who knows what our stay at the Monte Carlo Beach Hotel must have cost, where we spent two luxurious weekend nights (times about 30 journalists and accompanying Ducati staff) enjoying a spectacular view of the Monte Carlo skyline. But then we got on the bikes and headed into the city centre at dusk, and it all became crystal clear. In a city-state that claims the highest concentration of millionaires and billionaires in the world—and where the main pastime is being seen—the only way to pry the eyes of tourists away from the countless Flying Spurs, 458s and Veyrons parked in front of the Hotel de Paris, is with a massive ride-by of 30 thundering Diavels. People pointed and waved, cell phones snapped away, fathers held up babies for a better view—and Ducati’s marketing department gleamed from their PR coup. “It’s a bike for people who want to command attention,” Ducati’s product manager, Paul Ventura, would later say during the presentation. He wasn’t kidding. The journalists show up en masse. Ducati introduced the Diavel in 2011 and it was a radical departure for the Italian bike maker. It was a bold move for Ducati to design a power cruiser; the company is, after all, known for sport and supersport machines. But the bike has done well for the brand, selling more than 20,000 machines to date worldwide. The latest version, arriving at dealers this month, receives numerous changes. Visually, several items distinguish it from the outgoing model, the most notable being the new LED headlight and the shorter exhaust. 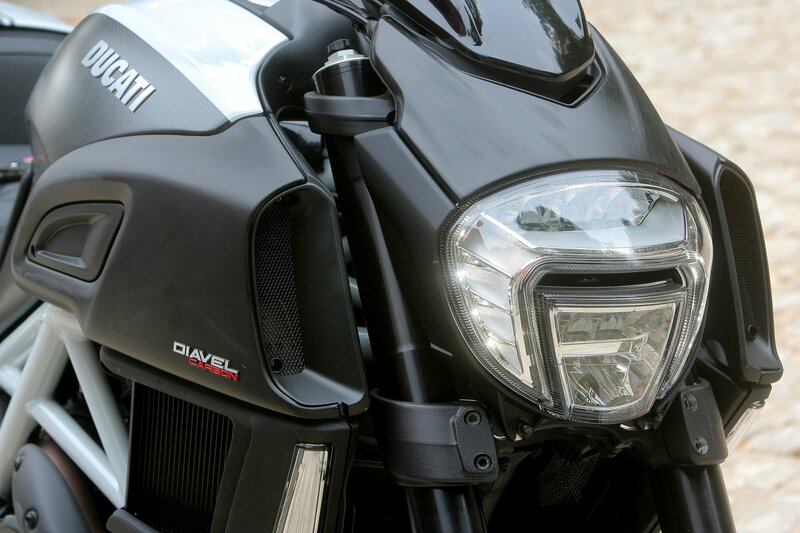 The Diavel is only the second production motorcycle to come equipped with full LED headlights (high and low beams) as standard equipment, the other being the Honda CTX1300 we reviewed last month. The headlight was designed using technology developed by Audi, making the Diavel the first vehicle on which there’s a transfer of technology between the two companies (in case you haven’t been paying attention, Audi now owns Ducati). There’s a new seat, the exhaust has been reworked, and there’s a lot of new bodywork. There’s a reshaped seat that is flatter, with new foam for improved comfort, but otherwise the riding position is unchanged. There are numerous other small changes—mostly to trim pieces and finish—that distinguish new from old. 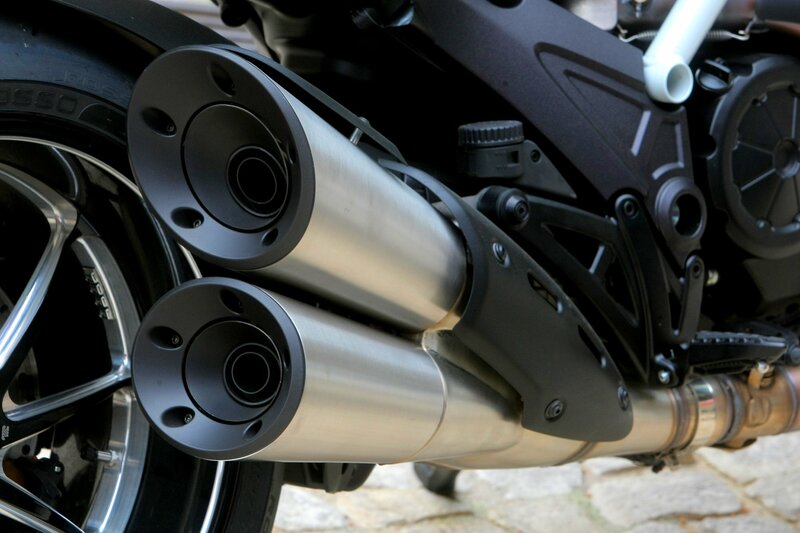 Compared to the old mufflers, the new slashcut silencers look like high-end accessory items. The biggest changes have been made to the engine, which is borrowed from the newest Monster 1200. It’s the 1,198 cc Testastretta 11° DS (for dual spark). It now has two sparkplugs per cylinder and a higher compression ratio (12.5:1 vs. 11.5:1), as well as revised engine mapping. Horsepower is unchanged at 162, but torque has been increased by 4.5 per cent, with most of the added torque arriving in the low to mid rev range. Maintenance will be less intensive, as valve clearance intervals have been increased from 24,000 km to 30,000. The new slashcut mufflers are standard, but look like high-end aftermarket units. When specifications are quoted, there’s usually some confusion; we were told the Diavel has lost five kilos, but a look at the published dry weight of the outgoing model shows 210 kg (463 lb) for the Diavel and 205 kg (452 lb) for the Diavel Carbon, which are identical to the 2015 model. As before, Marzocchi provides the 50 mm inverted fork and Sachs the single shock, and suspension is fully adjustable at both ends. The digital display now includes a fuel gauge, as well as tach and speedometer. Finally, there’s now a fuel sensor in the tank so there’s a fuel level gauge included in the TFT display giving you a heads-up on your fuel level before the fuel light comes on. 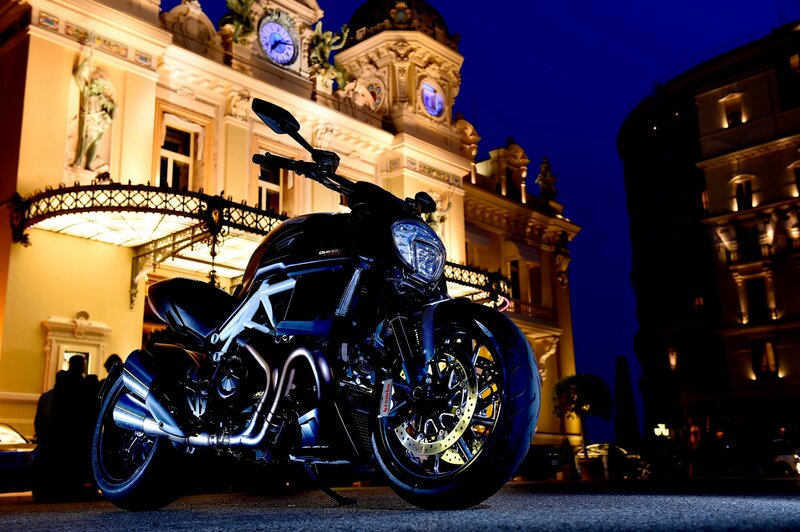 The amount of attention we’d received during our evening ride through Monte Carlo wasn’t surprising considering the Diavel’s booming exhaust note. It’s not excessively loud, but anyone within earshot will turn to look after it fires up. My test bike was a Diavel Carbon model, decked out with carbon-fibre front fender, fuel tank covers and passenger seat cover, forged nine-spoke wheels and brushed aluminum mufflers. It costs $21,995, a $2,700 premium over the standard model. The headlights are LED; the technology was borrowed from parent company Audi. There’s no key used to fire up the Diavel, but rather a key fob you can keep in your pocket. To start the engine, you either push the kill switch down to activate the ignition, or press a button located atop the gas tank, just beneath the upper LCD display. There are two display monitors, the lower one a colour monitor that displays the three ride modes (Sport, Touring and Urban) and other info. The upper screen shows speed, engine revs and temperature, and time. 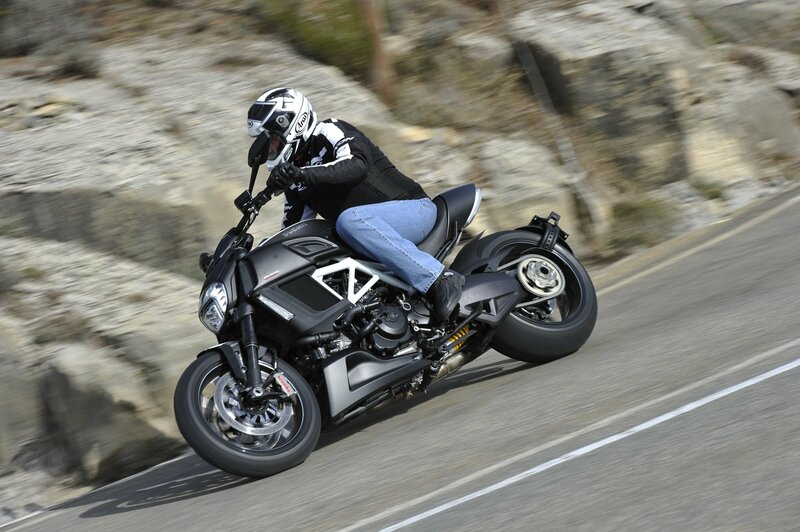 The Diavel has a relaxed riding position, similar to a naked bike, but with a slightly more forward footpeg position. The seat is deeply sculpted, so you’re pretty much dedicated to one riding position, though it’s at least a comfortable one that proved capable of handling a full day of riding, though we did make numerous stops. 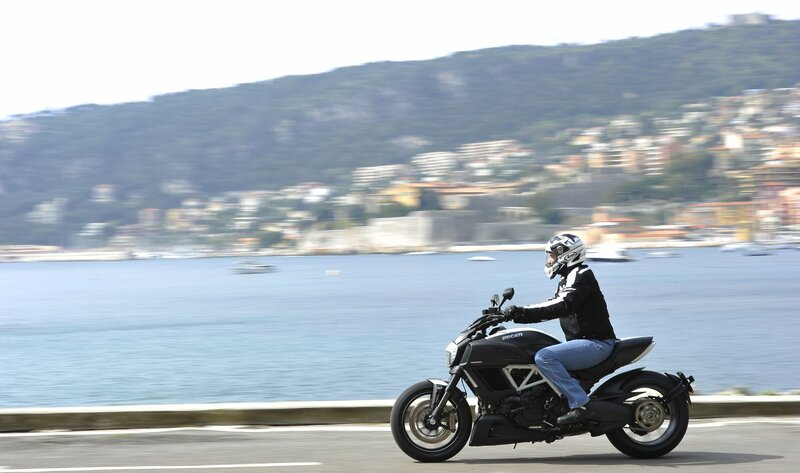 Riding position on the Diavel is relaxed, with your feet slightly forward. Despite its naked-bike-like riding position, there’s no mistaking the Diavel for a svelte roadster; it’s a long (wheelbase is 1,590 mm), imposing motorcycle, and the Carbon’s claimed wet weight is 234 kilos, though it still undercuts the Yamaha Vmax by an astounding 76 kg. 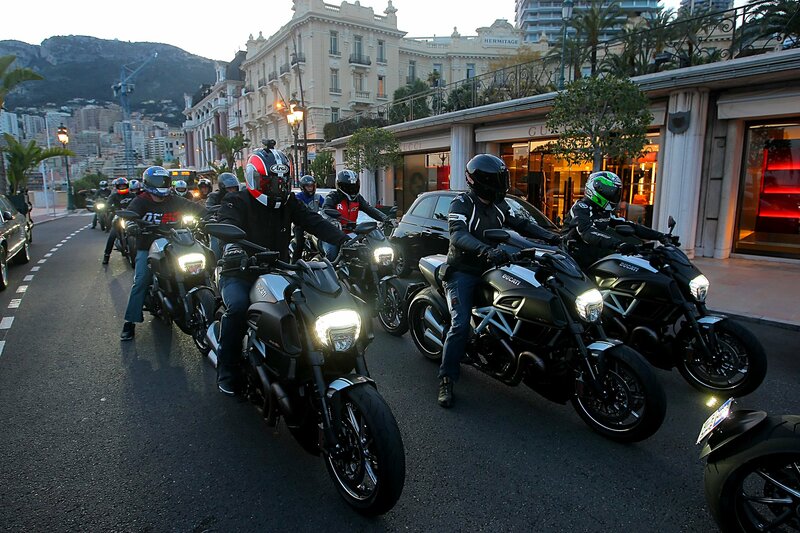 Heading into Monte Carlo’s narrow, winding streets, the first thing I noticed was the Diavel’s resistance to lean freely. Its ultra-wide 240 mm rear tire gives the bike a preference for riding in a straight line, though I have to admit that Ducati has done a fine job of managing its handling, and the Diavel is more nimble than the Vmax and has much less of a tendency to stand up in turns than the V-Rod Muscle, which also has a 240-mm wide rear tire. The Diavel is more of a straight-line bike than Ducati’s other offerings, but handles better in the corners than muscle bikes from other manufacturers. The mountains north of the city offered plenty of opportunity to pitch into a lean. The Diavel handled tight switchbacks competently at a surprisingly spirited pace, without running wide at the exit, though you can feel the need for constant pressure at the handlebar to keep it running tight. You get accustomed to it after a while and its reluctance to lean becomes almost invisible. However, I suspect a Diavel rider would have to work quite hard to keep a quicker pace in a swarm of true naked bikes and sport bikes. The best thing about the Diavel is its engine. It is a torque monster, but it’s also quite manageable regardless of which of the ride modes are chosen. In Sport mode, power comes on with a Foreman-like punch from low revs, and you can feel the seat bolster pushing on your backside like an impatient shopper in a grocery store checkout line as the bike accelerates. The engine pulls hard up through the rev range and speed builds with surprising urgency, yet you can also take comfort knowing the supersport-spec monobloc Brembos will slow you down hard with the added support of ABS. Handling is helped by fully adjustable suspension in front and back. 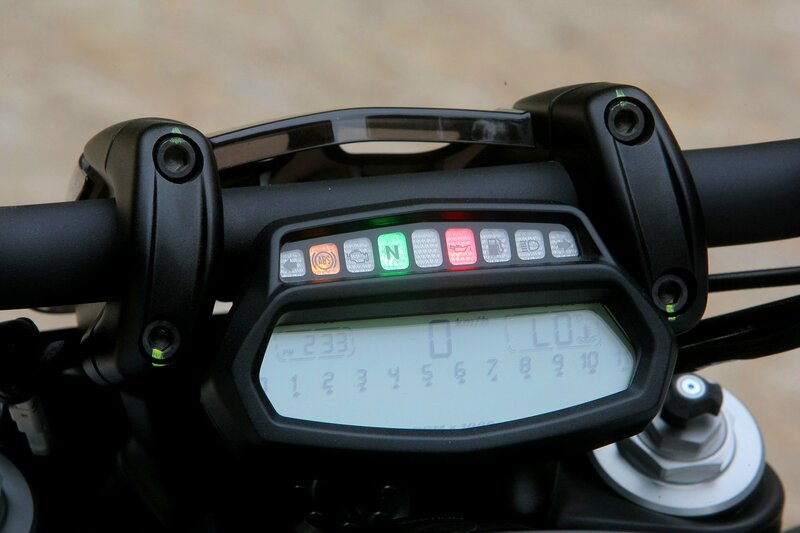 Ride modes are easily selected using the left handlebar’s switchgear, yet I remained mostly in Sport mode, which offered maximum output but with more aggressive throttle mapping than Touring mode. I did switch to Urban mode when wandering about town, because its softer throttle mapping and limited output (100 hp) offered a much smoother ride when rolling over cobblestones and low curbing that crisscrossed the pavement. Staying in either of the two other modes would cause the bike to lurch forward, as my hand would sometimes jerk the throttle going over the pavement irregularities. Alas, it was a relatively short ride at just 120 km, though it felt like twice that long due to the French Riviera’s high ratio of turns per kilometre. 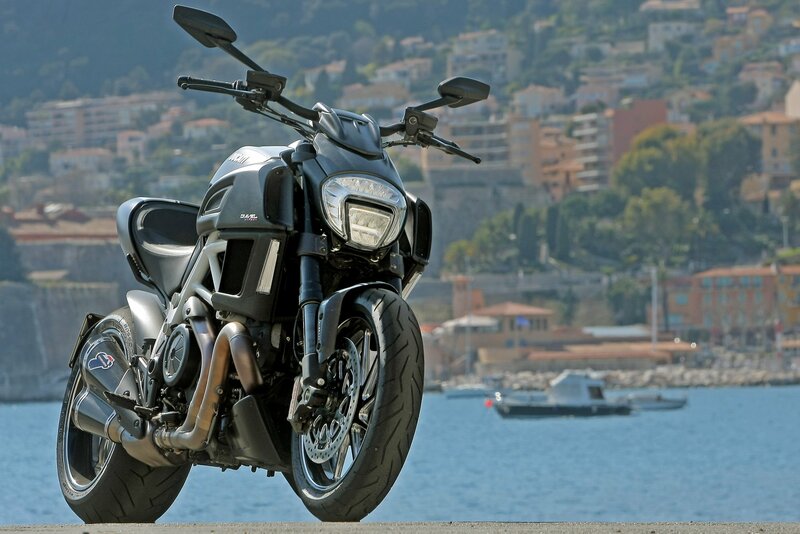 By nature, I would have preferred to ride a sportier machine, but the Diavel handled better than the other bike in its class (though, admittedly, there are few), and I never felt I had to restrain myself too much, as I would have on a typical power cruiser. If you want a flashy power cruiser that doesn’t give up all its handling in exchange for looks, the Diavel fills the bill. 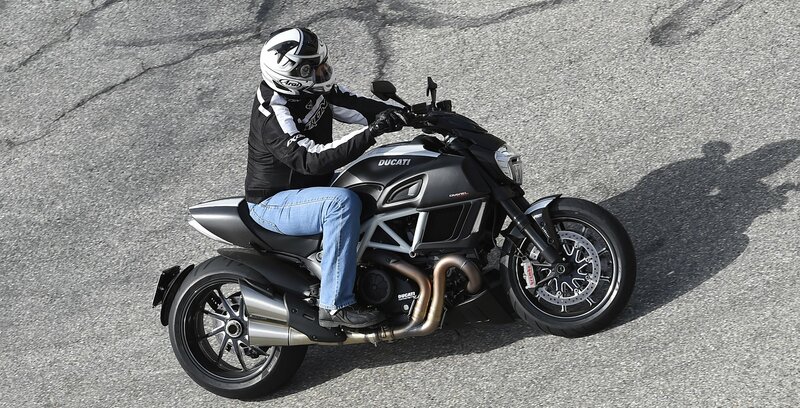 The Diavel is an acquired taste. Of all the bikes in Ducati’s line up, it’s the only one that puts a greater emphasis on styling than on handling. This is why it has already appeared in two Hollywood blockbusters, The Wolverine and Jack Ryan: Shadow Recruit, and you’ll likely see it in other films in the future. Fortunately, it backs its uncharacteristic (for an Italian make, anyway) styling with handling that’s well above the class standard, and a gutsy engine. If turning heads is among your higher priorities when you ride, at least with the Diavel you can get the attention-grabbing styling without making too big a sacrifice in ride quality or performance. When riding through town, Costa used the Urban engine management mode to keep things under control. Costa didn’t feel like the Diavel’s weight and stance held his riding back much. Costa pitches the Diavel into a curve. The musce bike was a bit held back by its beefy rear tire, but still handled better than its competitors. The digital display now includes a fuel gauge.